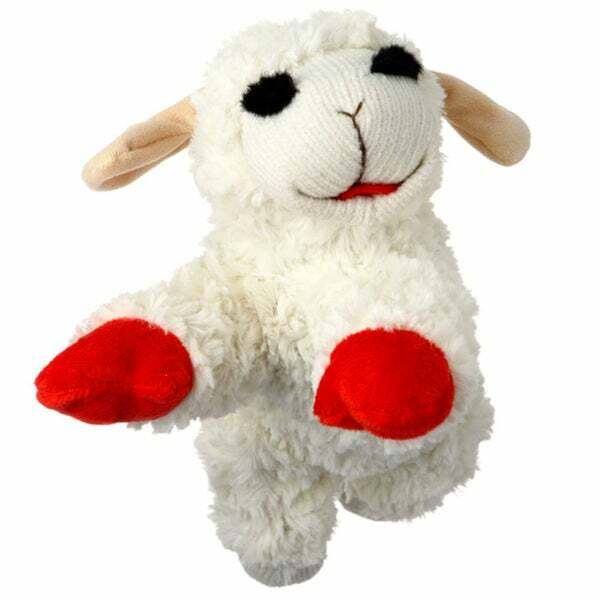 MultiPet 48372 Lamb Plush Chop Dog Toy, White, Small, 6"
Let your pet have hours of fun with this fantastic lamb toy. Made of long-lasting nylon and easily handwashed, this engaging toy has an adorable design and boasts a squeaker to add interest and excitement for your dog. Bandit loves lamb chop but they only sell the small ones in the store. I have bought 10 little lamb chops but since my boy is 100lbs this was a great size for him! Although our toy poodle has this toy in all sizes, he really enjoys his large version of Lamb Chop. We recently sent this as a birthday gift to another dog we know. The toy is made extremely well. This lamb chop dog toy is incredibly good for the money. It is soft plush and adorable. It is my dogs favorite toy. Sometimes she sleeps next to it or on top of it. I would definitely purchase it again! 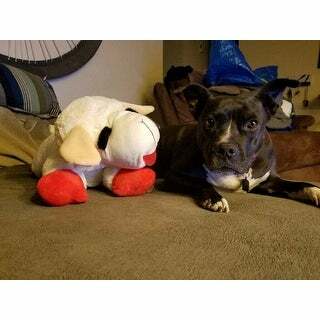 I brought this large lamb chop animal for my cousin’s dog; and she simply loves it! Because it’s larger then the ones in the pet store, it’s like her personal teddy to sleep with. 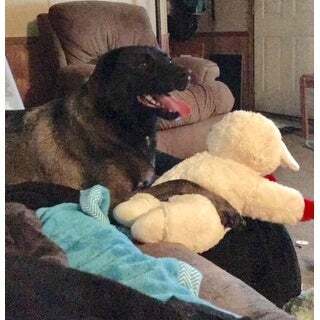 If you have a large dog like this German shepherd/ then you might consider getting this lamb . I bought these for our two retired racing Greyhounds, and they love them. They prefer their squeaky toys and use these for snuggles. They are well made and will wash in machine on gentle cycle if put into zippered pillow covers first. I wash all their toys in the zippered pillow covers and hang to dry on shower rod. These are also perfect for a baby or young child in that they have no parts to come off to hurt a young child. Even my little stuffies play with this jumbo lamb chop. My dog loves this toy, It's his favorite. Dogs love to cuddle lamb chop. It’s the new favorite toy. My dog loves this toy. Its fluffy and soft. This is nice to put in the crate when crate training your puppy. They settle down more when they have somethings as big and soft as they are in the crate. It's like a sibling especially if it smells like their nest at home. I've had good results with these and I am referring to as friend. This is adorable. It is very, very soft and so cute. My cat loves curling up against it. I would buy again. Our dog loves these. His favorite toy! Well, if this isn't the cutest dog toy ever!!! So soft, have 4 month old golden retriever, so needed something of a size. I opened box when it arrived, and she took it out of my hand immediately. Carries it in her mouth everywhere she goes. So cute, will make you want a dog if you don't have one already. My dog loves this toy. My dogs have many lambchops in different sizes. They've torn up the lambchops. One of their favorites. This big one is for Christmas.